Formulating ideas for large gardens is often simpler than working on small outdoor spaces, when grand concepts, master plan layouts and extensive planting are by and large developed intuitively, with greater room to express landscape design ideas and articulate them on-site. 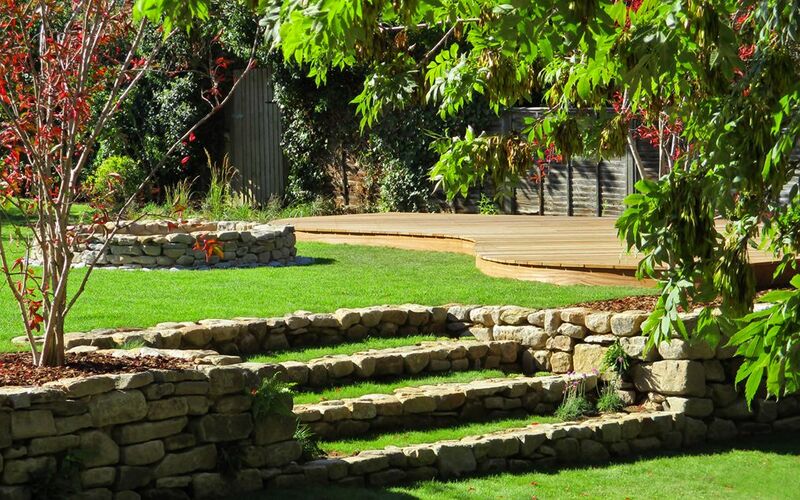 Granted, the logistic complexities of constructing large gardens entail further considerations with regard to earthworks, quantity surveying, work schedules and budgetary responsibilities. 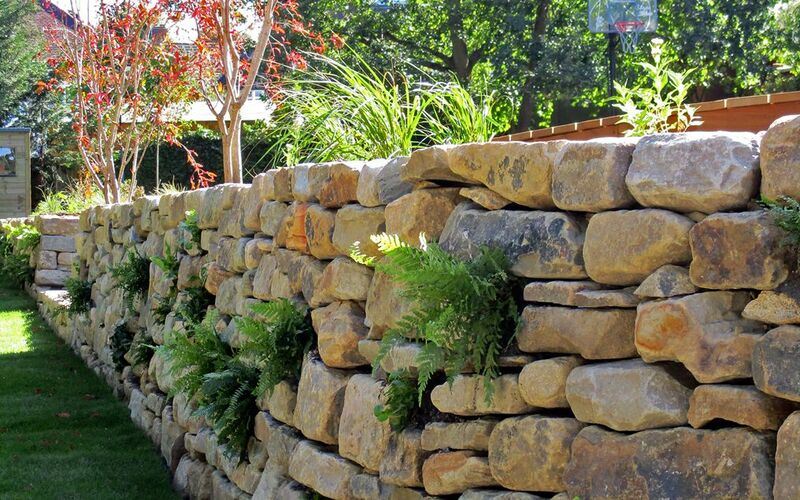 Yet, the inspiration of energising sky, native trees, wildlife, water and local materials steers large garden design ideas in London firmly towards an equilibrium of ecology and man-made structures within a diversified spectrum. 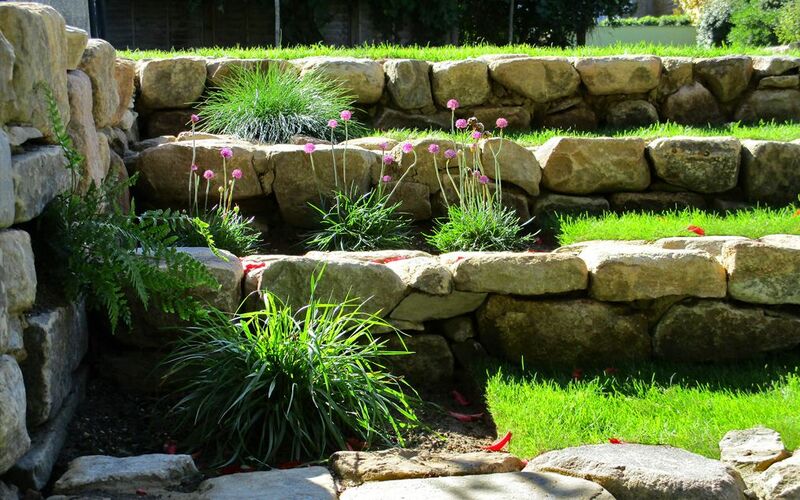 Natural stone steps with native planting in a large London garden. 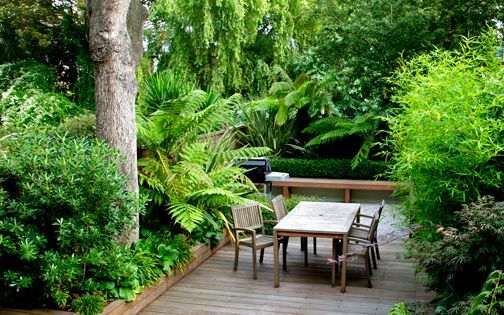 Each transition in a large garden, however subtle, should be a celebration of textures, materials, detail and foliar changes. In this large London garden in Whetstone, the gradient slopes gently around a retaining wall to enable unique passages into a woodland via grassy walkways, while the central point is stepped for a more direct route. Stone fire pit and Spindle tree in autumn. The larger the garden, the more pronounced its focal points ought to be, clearly defining and anchoring various zones to draw the viewer's eye towards hidden passages – unveiling the subsequent progression. 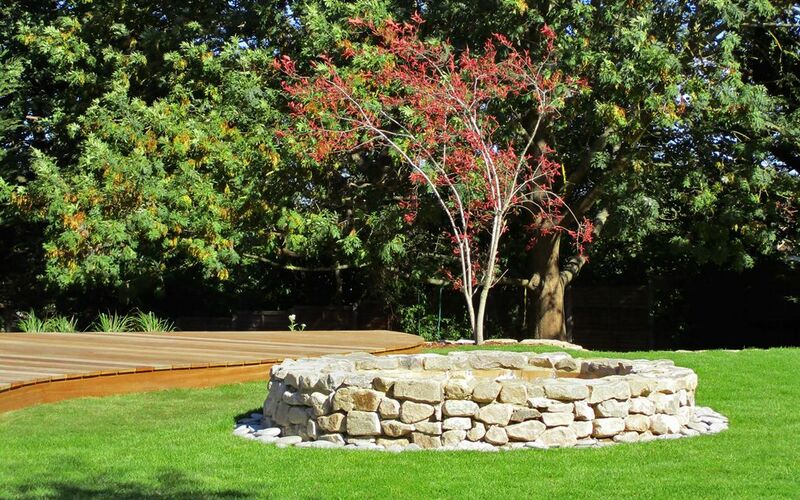 Here, a native Spindle tree forms a striking centrepiece viewed from the house, while completing a trio of architectural elements alongside a sinuous sun deck and circular stone fire pit, set above the ancient woodland of a large back garden in North London. Curved deck with bespoke fascia in a large garden North London. 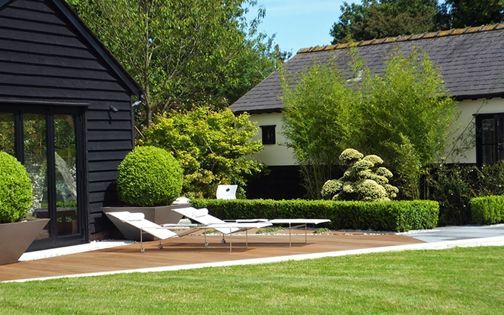 Decking expresses a natural ambience and great versatility through organic contours and leading sightlines, while mitigating tricky level changes. 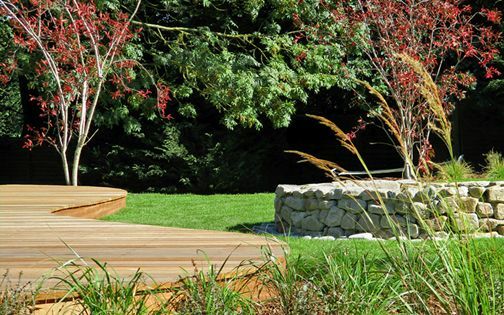 When detailed in hardwood from renewable sources, decks form long-lasting, warm and recyclable elements which complete the palette of essential natural materials in many large garden designs. Native habitats for sun and shade with ferns, trees and grasses. Creating native plant habitats is easier to achieve than it commonly seems, often underrated or overlooked, yet is environmentally pivotal in restoring ecological balance and conserving natural beauty in sites of varying scales. 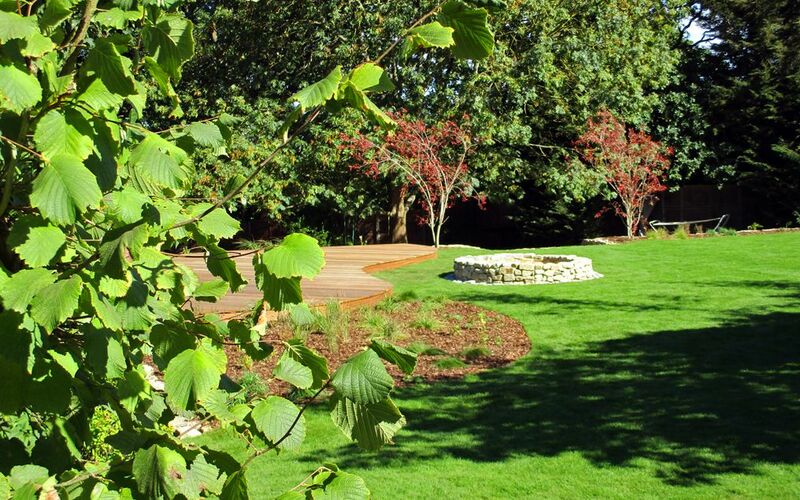 With the UK's 5 predominant wild habitats yielding numerous grasses, rushes, bulbous plants, deciduous trees, coastal and woodland floras, we're able to design imaginative plantings which aren't only wildlife-friendly and long-lived, but are also far easier to maintain and manage in large London garden settings. Indigenous Hazel, Spindle and Ash trees. If you tallied all of the UK's native tree species, including a handful of large shrubs and a few endemic and naturalised ones, you'd reach a figure of 100 at a push. With thousands of trees originating in Asia grown here, this dendriform scarcity seems bewildering when hunting for some architectural, branchy inspiration of indigenous origins. Yet, amid a plethora of unique fresh cultivars proliferating gradually with coloured, twisted and flaking bark, alongside unusual flowers, catkins, leaves, berries and multi-stemmed forms, there's a whole new world of arboreal delights to be enticed by to consummate native planting schemes with added zest. 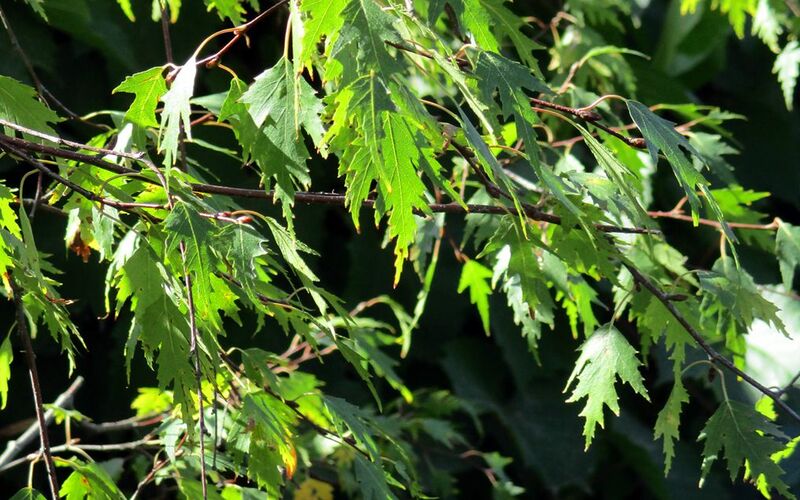 From Dogwoods to Willows, Beech to Birch, and every Hazel, Holly and Hornbeam in their midst, there's much to gain from forging a balance between indigenous and exotic floras to enhance originality and sustain natural ecosystems. 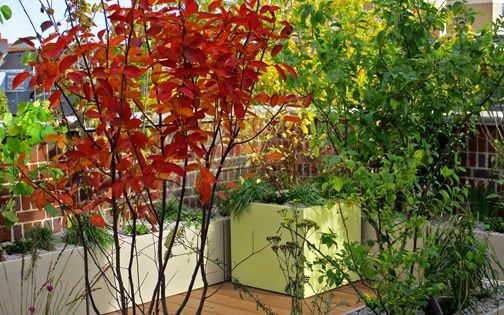 Leafiness energises every garden we design; none more so than in large gardens, where foliage provides priceless sound and movement and marks the change of seasons. The ecological significance of leaf cycles sustains thriving large garden designs with essential nutrients, winter mulching and reliable habitats for native wildlife. Wild native planting for nectar and berries. UK wildlife numbers are falling faster than anywhere else, with a tenth of species at great risk. From habitat loss to pollution, invasive species, climate change, industry expansion and over-consumption, the direct causes to this astonishing condition are soaring. Even the tiniest micro-organisms are vital to balanced natural systems, upon which greater species derive their sustenance. 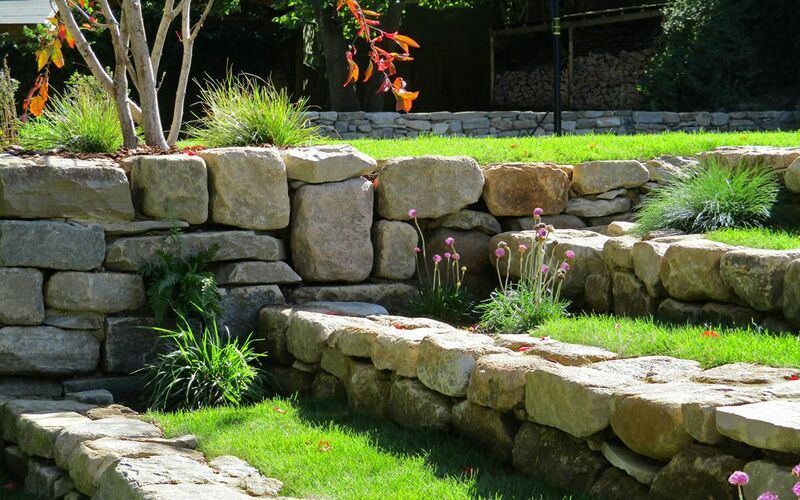 Large gardens are ideal environments for sustaining wildlife, where diversity and management of native habitats, and the designation of undisturbed areas, provide indispensable refuge to rejuvenate both flora and fauna. 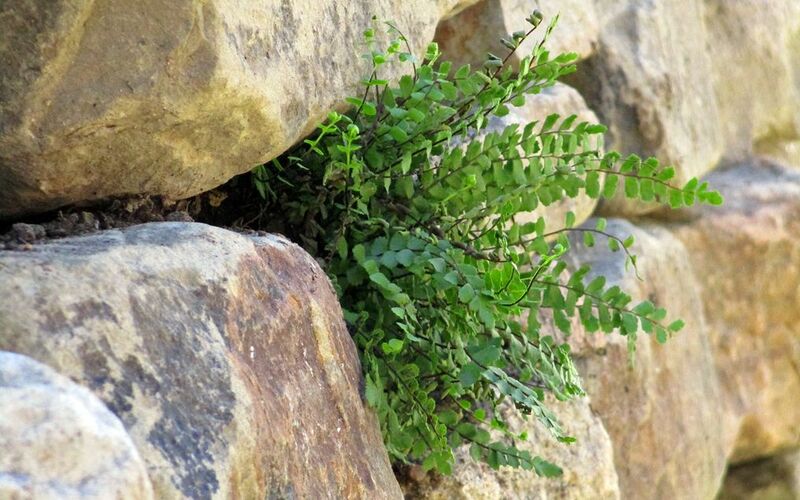 Native Maidenhair spleenwort fern in stone wall crevice. 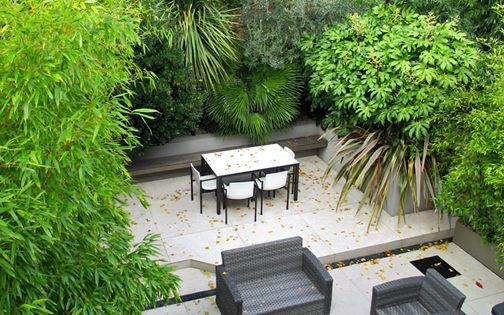 Across countless large garden designs, nuanced detail tends to dissolve into the background, where we primarily cater for scale, volume, outline and a connection with the surrounding environment using broad strokes. Both the familiarity and intimacy of well-crafted design details find their niches in seating, viewing and transitional areas, subtly enriched with refined articulations of up-close tactility. 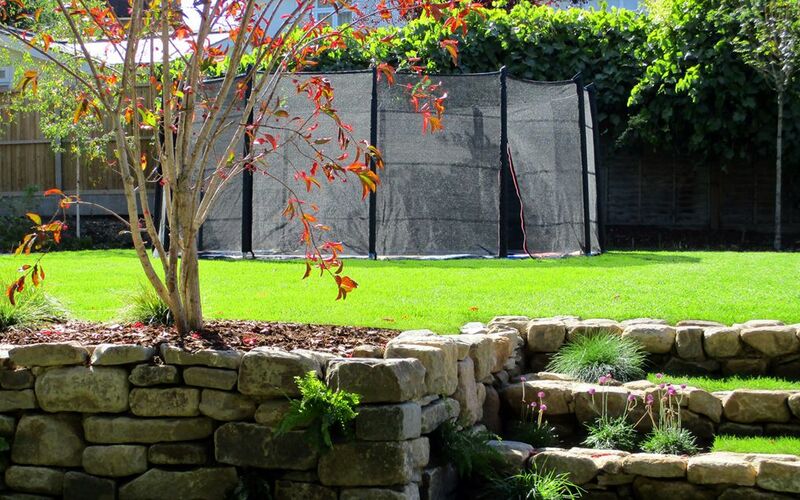 Circular sunken trampoline in a large London family garden. A finely tuned large garden design accommodates generously for all family members; its central ideas focused on the interchangeability of spaces, amenities and experiences, alongside long-term growth and stability, wellness and togetherness. We're invariably attuned to the natural progression of outdoor family life, seeking harmony all round, when utilising the garden to the utmost forms a multifunctional yet multigenerational, fun and safe adventure in large London gardens. 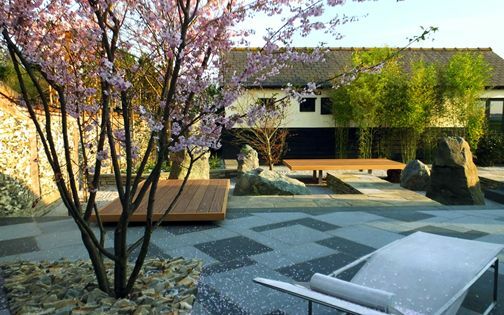 Creating inspiring large gardens which are evocative of their settings combines the thoughtful ideas and aspirations of both their designers and owners. 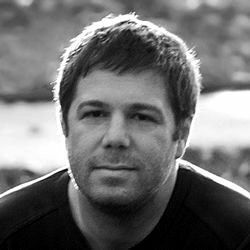 We strive to integrate fresh yet practical design concepts into ecological frameworks which continually evolve and sustain our clientele within diverse environments across varied scales. 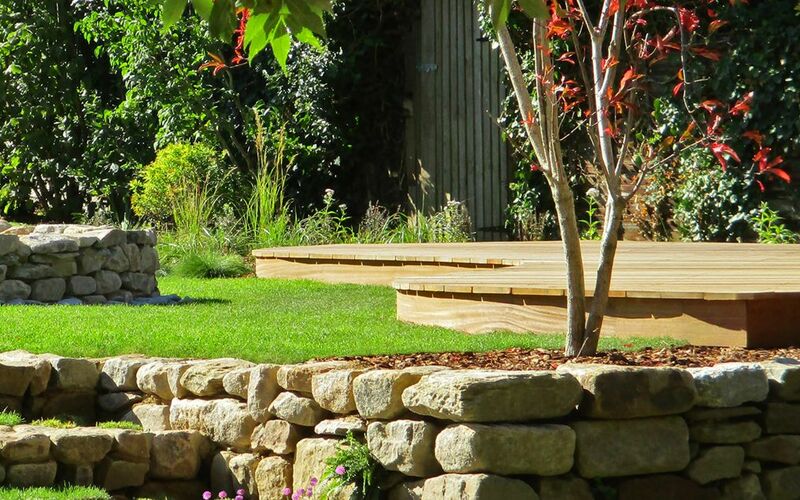 Simplicity of outlines, effortlessness in planting palettes and a fluid, tactile continuum of natural materials underline the majestic qualities of clear large garden design ideas – those distinctively conceived to extend the endurance and liveability of large London gardens.